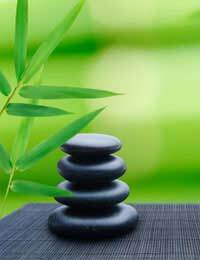 Feng Shui is the ancient Chinese science of using your surroundings to help balance energies, thus allowing you to live a more relaxing and tranquil life. The name feng shui (pronounced fung-shway) literally means “wind” and “water.” Both elements have been associated with both a good harvest and good health in Chinese culture. The fundamentals of feng shui are based on the Taoist vision that respects the elements of nature how those elements can affect your chi or energy. Chi energy can be either positive or negative. Fortunately, feng shui techniques allow us to reverse negative energy. No one really knows how long feng shui as been in practice. The earliest records of form school (also known as the landscape school), the oldest school of feng shui, can be traced back to the Han Dynasty, which ruled in the southwest region of China from 200 B.C. until 200 A.D. Form school was used to find a suitable place for a tomb, something that is still practiced in China today. The basis of the form school theory was that the all things in the landscape are living and charged by energy (chi). Form school principles examined the shapes and symbolism of one’s surroundings to see how those could be applied to every day life to provide a more harmonious existence. Form school feng shui practiced changing negative chi energy into positive chi energy through changing your environment. In 888 A.D., Yang Yun Sung refined the teachings of form school feng shui into that which we know today, known as compass school. Yang Yun Sung wrote many influential texts such as The Art of Rousing the Dragon, Methods of Locating the Dragon’s Lair, and Canons Approximating Dragons. The main emphasis of his writings was to select a site that contained dragon’s energy. This energy, often referred to as dragon’s breath, eventually known as chi or qi. Yang Yun Sung’s works were further refined by Wang Chih about 100 years later. He created the lo p’an, a compass which can be used to position things in relation to the north and south. The compass school does not disregard the teachings of form school but rather extends it. The compass school form of feng shui is seen as being more scientific whereas form school feng shui is more practical. During the Chou Dynasty, King Wen began using the baqua to promote the flow of energy in a dwelling. The compass school would also use the yin-yang theory. This states that yin (a passive energy that prevails when you sleep) and yang (an active energy that prevails when you are busy working) should be balanced. Balancing the two ensures you of more positive energy as well as the greatest harmony and peace. The five elements – wood, metal, water, earth, and fire – and their use was another theory which began with the compass school. By the late nineteenth century, the two schools merged into what is now known as the classical or traditional school of feng shui. Today, millions of people practice the combined schools of feng shui to help bring harmony to their lives, protect their health, and give them positive energy.